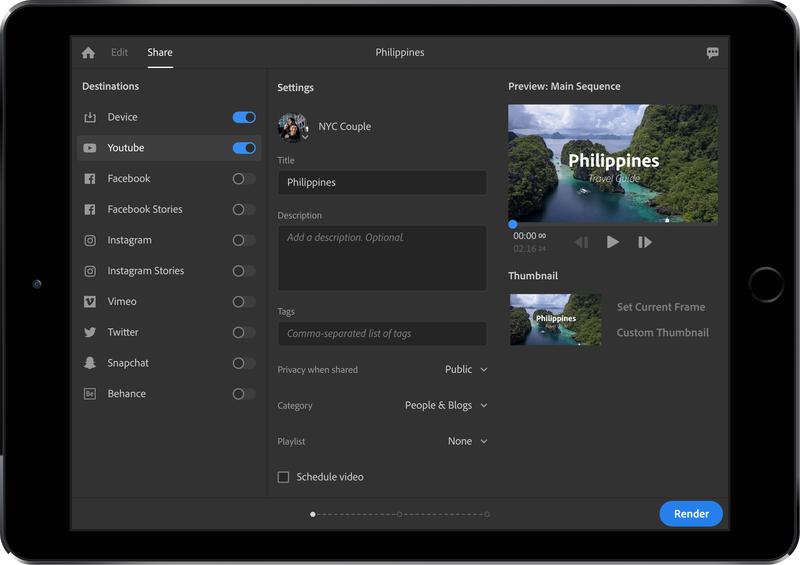 Earlier this year, Adobe previewed Project Rush, a new multi-platform video editing tool. Today, at its Max conference, the company announced that Project Rush is now Premiere Rush CC and an official part of the Creative Cloud suite. The idea behind Rush is pretty straightforward. It’s meant to provide video creators with a modern all-in-one video editing solution that allows them to quickly edit a video and publish it on platforms like YouTube and other social networks. Indeed, it’s very much meant to be the video editing tool for the YouTube generation. Rush takes the core parts of Adobe’s suite of video and audio editing tools and combines them in a single mobile and desktop experience. That means you get a set of Motion Graphics templates, for example, that were specifically designed to give Rush users easy access to customizable titles. The color correction system is built on top of the same technology that powers the more fully featured and complicated Premiere Pro editing tool. And the audio-editing features, including one-click ducking, are powered by the same code as their counterparts in Audition. All of those edits easily sync between platforms, giving creators the ability to start editing on their phone, for example, and then finish their work on a laptop. The current version of Rush is pretty much what Adobe announced a few months ago, but the company also used today’s announcement to preview what’s next. Soon, you’ll also be able to edit on Android (Adobe promises a release in 2019) and get speed controls so you can speed up and slow down your videos (a feature that YouTube creators are bound to overuse), as well as the ability to more easily create different versions of your videos for multiple platforms. The team also promises to increase performance over time. Premiere Rush is now available to all Creative Cloud All Apps, Premiere Pro CC single app and Student plan subscribers. There is also a single app plan for $9.99/month for individuals (or $19.99/month for teams). In addition, there is a free starter plan that gives users access to all the apps and features, but limits exports to three projects.